All it takes is one relaxing hour in a hot tub to make you want more. It s just what the doctor orders to de-stress after a long day at work. However did you know that there are a few more interesting reasons to have a hot tub at home? One reason is to of course, buy it for sheer enjoyment. No matter if you plan to use it alone or for entertaining a few friends, it s a great way to spend an evening. You can crack jokes, and enjoy the tub jets while having a few drinks in the hot spa. Health reasons are another one of the more popular reasons for buying a hot tub. It provides relief from aching backs and sore muscles by melting away all the soreness from aching muscles. Outdoor hot tubs can add some elegance and enhancement to your landscape. With added features like a waterfall, these hot tubs improve the aesthetics of your backyard and can in fact increase the value of your home if you plan to sell it anytime. 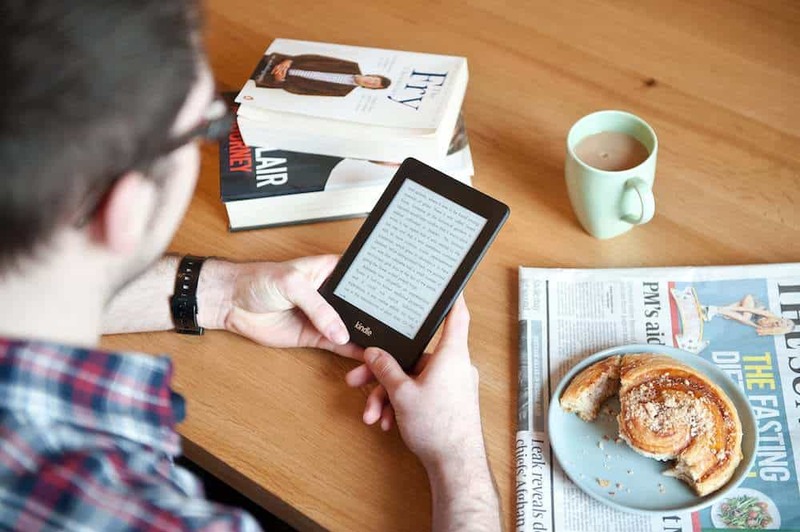 Looking at these reasons for buying a new device, you naturally feel like getting one for yourself too! However you can't buy one at the spur of the moment. It is something you have to buy after careful thought and consideration as it has to fit your home and your requirements. Moreover there are so many types of home spas with variable hot tub sizes available in the market, that these factors prove helpful at finding the best hot tubs. The Top 5 Best Hot Tubs In The Market That Money Can Buy! If you love travelling and enjoying spas, then the Coleman Lay Z Spa is right for you. This is an inflatable unit that needs only 30 minutes to set up and ready to inflate, and another 10 minutes to inflate. 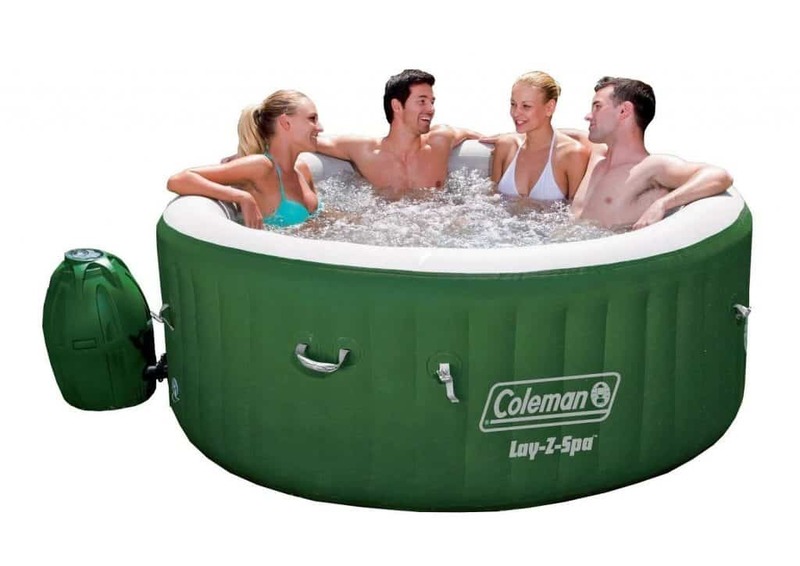 This Coleman can easily hold 4- 6 people pampering themselves in relaxed, heated water and surrounded with soothing bubble jets. It comes with a Digital Control Panel and an automatic timer-controlled system where you just have to set your preferred temperature, start the massage system and relax! The four person unit is extra strong and durable thanks to its leatheroid and puncture resistant TriTech, 3 ply exteriors. Its walls are constructed using I-Beam construction which permits you to sit on its sides without worrying about the spa bending over or buckling, giving it an edge over competitors. Its air pad cushioned floor under the spa not only provides additional foot and backside support but also helps insulate and minimize loss of heat through its base. The Intex 77in PureSpa Portable Bubble Massage Spa Set is perfect for relaxing in after a long, hard day. It pampers you with its soothing bubble jets which surround the spa s interiors and are easily activated through its control-panel. It s in-built hard water treatment system makes water so much gentler on your skin while it s heating system can be adjusted to fit your personal temperature preferences for an optimal spa experience. The above ground spa comes with a carry bag for easy transport and storage while it s inflation hose provides for easy inflation. You are assured optimal comfort, durability and support wile in the spa due to its fibre-tech construction and puncture-resistant material. It s insulated cover and lock minimizes heat loss while maximizing safety. Maintenance is easy as the portable tub comes with two filter cartridges which are easy to replace. Water can be maintained at temperatures between 68-104 degrees F.
Comes with heating system, 2 filter cartridges, thermal ground cloth, carry bag and floating pool chlorine dispenser. 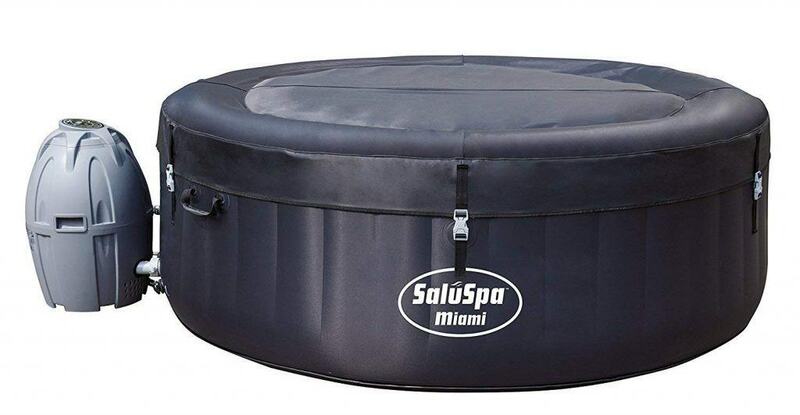 The SaluSpa Miami AirJet is the world s first premium inflatable spa which can be used both indoors and outdoors. It s easily set up within minutes without the help of any tools; you only need it s pump to inflate it. It comfortably gives an affordable spa experience to 4 people. 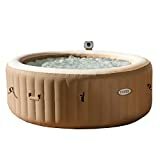 It s rapid heating system quickly and safely heats up your spa without your having to leave the tub while it s digital control panel sets your desired temperature of up to 104 degrees F. The control panel also activates the spa s massage system comprising of 120 bubble jets, perfect for soaking sore muscles. The 4 person unit is strong and durable with its TriTech material comprised of a polyester mesh core in between two laminated PVC layers. It s I-Beam construction makes sitting on the spa sides safe without any risk of bending or buckling. The spa includes an inflatable cover to keep the water warm and free from debris, chemical floater and water filtration system which keeps the device clean and a DVD explaining the spa s setup and maintenance. The SaluSpa Palm Springs AirJet offers a serene and comfortable spa experience. It s mature range of colors and superior leather look and texture adds luxury to the spa. It s easily set up indoors or outdoors and blends with wooden decking or the lawn. It can accommodate 4-6 people and has a large water capacity which creates a more spacious spa experience. It requires no tools or professional installation. It s massage jets and 104 degree F water temperature is perfect to massage your sore muscles and help you relax after a long day. It s cover maintains optimal water temperature while other added accessories include it s setup and maintenance guide DVD, chemical floater and filter cartridge. Digital control panel for setting desired temperature and activating the massage system. The ultra-portable Comfort Line Products Spa-N-A-Box Portable Spa gives relief for those suffering from chronic back pain. It s 100 micro air-jets give a soothing massage to help soothe aching muscles and help you relax at the end of a long day anywhere you want. Heater maintains a comfortable temperature of 104 degrees F and its 24 hr filtration system keeps your water clean all the time. Comfort Line Spa easily installed in 20 minutes without any tools and plugs into any standard 110V Grounded outlet. This 110v unit is sturdily built with heavy duty 3 ply PVC Vinyl, the same material that is used for building white water rafts. It s soft vinyl floor is comfortable and padded and much easier to get in and out than acrylic and fiberglass hot tubs. You need to first decide where you plan to place your hot tub. Buying an indoor unit is advised if you have sufficient space at home as you can use it throughout the year. However if space is a constraint, you can always opt for outside hot tubs or garden hot tubs. If this is the case, choose a spot near an electrical outlet for your backyard hot tub and which is level and strong enough to withstand the hot tub outdoor weight when full. The deck or patio is a popular spot as it s easily accessible and safer for acrylic tubs which tend to fade after hours of direct sunlight. As hot tubs are designed to accommodate a fixed number of people like the 2 person spa, you need to buy one that s big enough for your family. If you have a family of 6, buy a 6 person unit which accommodates 6 people so that you can enjoy quality family time in the hot tub. Your home should have sufficient space indoors or outdoors to fit large hot tubs like the 10 person hot tub, which you can also use to entertain a group of friends! If you are looking for something intimate and cozy, look for a mini hot tub. Whatever the size of the hot tub, most people agree that one with a depth of 3-4 feet is most comfortable as the water reaches above your shoulders. You can also opt for small hot tubs like the one person unit if you are looking for a hot tub spa for your personal use. If you plan to buy a spa tub for its massage, look for one with jets as it gives more massage power. The jets have to be strategically placed so that they massage the right areas. Most of the modern hot tubs today have jets with adjustable strength and water direction. All units come in varied interiors and exteriors; so choose one with a pleasing style and color complementing its surrounding area. There are hot tubs made of cedar perfect to place on your deck as they blend with the surroundings. While the cedar hot tubs have a natural and rustic look with a pleasing scent, they are maintenance intensive and not as comfortable as acrylic or fiberglass models. You should also decide if you want an acrylic or roto-molded tub. The interior shell of roto-molded hot tubs is built using polyethylene pellets and then inserted into a surrounding cabinet. The acrylic ones are made using an acrylic insert to create a smooth device with sculpted curves. If you are looking for an attractive hot tub with a lot of jets, an acrylic unit is a better option. A roto-molded hot tub is the better choice if you want a unit without hardwiring. Hot tubs and spas should have a cover so that the water is kept warm all the time. The cover also protects the device from any possible interior damage and from debris accumulation. If you are buying a hot tub to use outdoors, and if you have small kids or pets, buy a hot tub with a lockable cover. This is an important feature as you won t be able to sit down and relax comfortably in the device without seats! The most common is a hot tub with 5 seats but double seaters and 7 seater hot tubs are also rather popular. 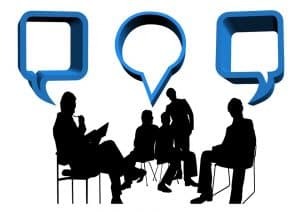 You have to decide on the number of seats you want based on how and whom you want to spend your time in it with. Retired couples with moved out grown up kids could consider a double seater. A 5-seater unit is better for a large family and in situations where more than 2 people will be using the hot tub at a time. The seven-seat units are for people who love having friends over for unit parties. Besides the number of seats, you should choose based on the types of seats. While standard seats comprise of a simple bench which let you sit straight up, there are also lounge and pivot seats available. A lounge seat lets you recline a bit with your feet on the floor while the pivot seat lets you rotate. This proves advantageous while receiving hydrotherapy from various jets as a health therapy. These special seats are growing in popularity, and are available as add-on options for many of the latest models. However as they take up more space than the standard bench seat, they are used only with 2 and 4-seat versions. There are a few other factors you can also take into consideration. For example built-in cup holders provide a place to hold your drinks while a hot tub with an aromatherapy feature offers added benefits. A swim spa is beneficial if you plan to use your device for low-impact exercising. 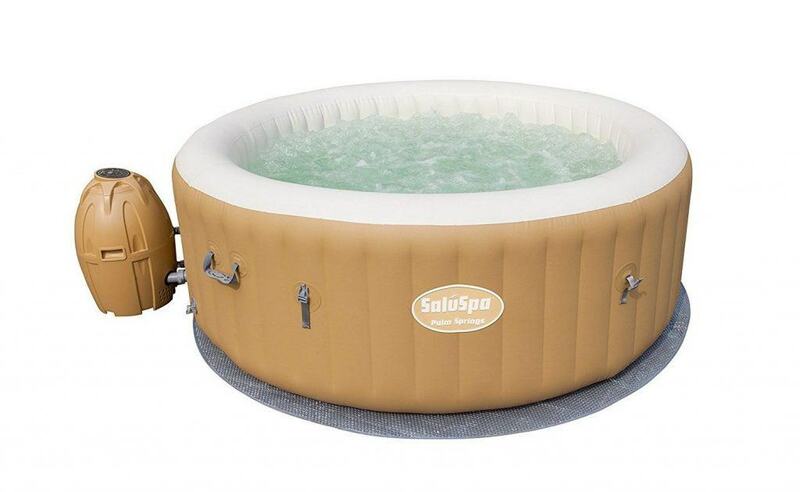 These spas are similar to a normal tub but have extra space to exercise. Also consider how many steps you have to climb to enjoy your hot tub. The easier is the access, the higher are the chances of your using your hot tub, and enjoying it! Of course, like any other thing in life, there are so many fun and soothing features you can include in the hot tub, if you have the budget to do so. Examples are a waterfall, a hot tub with wireless audio and video equipment to entertain you while in the unit and of course, special lighting effects to set the atmosphere with friends and your better half! Investing in a spa hot tub does not only entail the hot tub prices. You have to be ready to pay increased utility bills as you need additional power to run and heat your tub. So choose an energy-efficient model with a fully insulated tub and cover, as it minimizes your operating costs. It s also worth checking the water heater and pump s energy efficiency to cut down on your utility bills. Your hot tub dealer at the store will be able to guide you with your care and maintenance. You not only have to regularly check the water s pH levels, most hot tubs run on three sanitation systems comprising of chlorine, ozone and salt water with individual pros and cons. You have to assess them to find out which befits your budget and schedule. It s easier if you choose a hot tub with a cleanable filter and which runs on quality, quiet pumps. Remember, though these factors and buying guide does help you choose your hot tub, you can make your final choice only if you actually sit in the tub to find out how the seats and tub feels. This is the only and best way to make your final choice. Based on where you plan to place your outdoor spas, hot tubs are divided into permanent and portable hot tubs. The permanent ones are built into the ground and are generally made by pouring cement into a hole in the ground, just like you do while building in-ground pools. If you opt for a permanent hot tub, it is a wise choice as it s more efficient and durable a spa. However you need a contractor to fit it, and it requires a filter system, chemicals and heater to run. Moreover, consider the view it inflicts throughout seasons as it shouldn t change your privacy with changing foliage. Permanent tubs can t be moved, and as you need to be able to enjoy it throughout the year, you need to spend lots of time picking the right spot for it. Moreover, do get an estimate from your contractor to find out how much it costs to fit a permanent hot tub. Though these hot tubs are not cheap, they are indeed worth the investment! 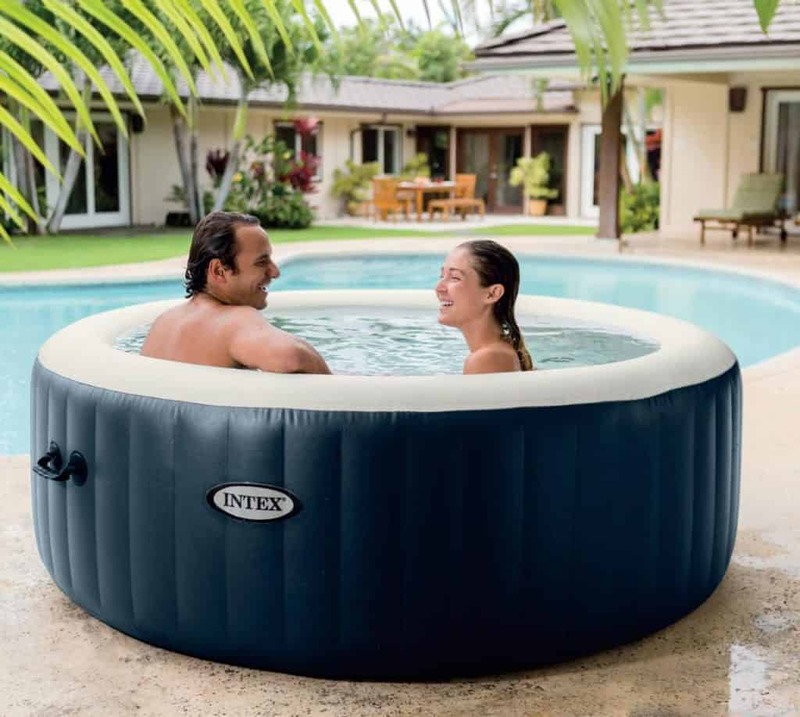 Portable hot tubs are independent units which sit above ground and are also called above ground hot tub which can be moved elsewhere when needed. Many people prefer a portable spa over permanent ones as they are self-contained with the features of a permanent tub. The only and main difference is that portable units can be moved around like while shifting houses. These hot tubs come in various shapes and sizes like round and corner unit which is why you need to know how to choose the right device without any regrets. These hot tubs are generally budget-friendly, can fit into limited spaces but come with all the features you find in a permanent tub. Portable hot tub spas come in various seating options and in different colors and configurations. Soft tubs are another popular choice with buyers as it s simple and easy to move, and has all the features of permanent and portable tubs. They are a cheaper option and can be used both indoors and outdoors. Inflatable soft hot tubs are easy to move as they are lighter in weight than traditional portable tubs and reach you deflated. 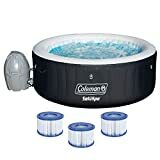 This makes its installation easy as you just unpack the blow up hot tub, inflate it using the accompanied motor, fill it with water and turn on its heater. Soft spas can be placed anywhere, even indoors as long as there s sufficient ventilation. It s also readily carried through doorways and stairwells as they can be deflated before moving. It is this feature of soft tub that make it a popular travelling spa option. You can carry it along with you to a camping trip or your friend s party or just pack it up and carry with your belongings if you are moving. Soft tubs are also cheap but still do help you relax and de-stress from the day s stresses as it has hot water and jets which work magic on your tired and achy muscles. Now you do agree that a home hot tub is a worthy investment to make for your home. It not only helps you de-stress but top rated hot tubs also help with entertaining guests and improves the aesthetics of your home. Though all this information proves useful, it may be difficult choosing the right hot tub for your home as there are so many hot tub brands, models and types to select from. 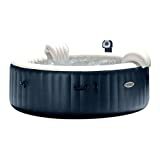 These hot tubs reviews should help you make your choice as you find out more about some of the best rated hot tubs in the market today.